For our port of call at Phuket, Thailand, the ship had tendered out at sea instead of docking at a pier like in Port Klang. To get to the mainland, you will need to secure a tender ticket for a boat to the Phuket beach. There are several timings available and each boat interval takes about 5-10 minutes. If you had booked a shore excursion like what we did, then they will arrange for you to meet your guide at a designated area and all the boat arrangements would already have been made. The transfer to the mainland was a rather quick ride – about 5-8 minutes. Along the way, you will be able to see the local sampans as well as private yachts all along Phuket beach. Keep your tour sticker on or else once you arrive at the pier, you will be mobbed by touts selling their Phuket tour packages. We had to walk a short distance to our tour bus for our shore excursion. There are many interesting sights along the beach as well e.g. mobile massage and manicure/pedicure tents. Do note that those colorful beach chairs are not free though – staff will come around to collect their rental fees. Some of the beaches there have problems with jellyfish, so check before you go wandering on a beach! 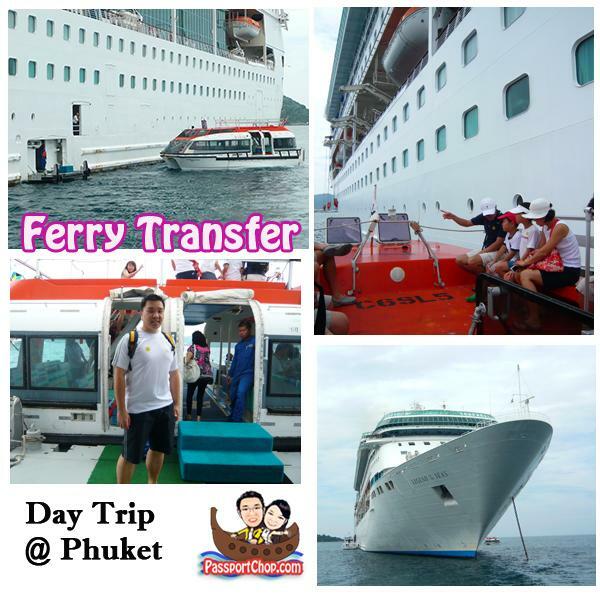 I note you book the cruise excursion at phuket…was it worth it? Do you believe it’s safe to do it on your own like take a taxi and go around? Can I expect to get a taxi easily? Not worth it at all – if u r first-timer to phuket, suggest just walk around Phuket town for some cheap food and shopping and water activities instead – a lot of time was spent travelling during this tour. What did you visit in phuket? Is phuket town within walking distance from the port or do we need to pick a cab? Is it safe to walk? We didnt have time to visit Phuket town – its within walking distance n shld be quite safe. Thailand is one of my favorite countries to visit. Lots of beautiful beaches especially near Phuket. I didn’t spend much time in that city, but it looks like you had a nice day trip. Thanks for the write-up on Phuket. I am taking a Royal Caribbean Cruise, where we’ll have a chance to visit Phuket. May I ask where in Phuket the ship will dock? Thanks. The ship does not dock at Phuket – it is tendered (meaning it is anchored in mid-sea off the Phuket coast) and there are boats that ship passengers to the coast. Thanks so much. Will that be in Patong Beach, then? Truly appreciate your blog, this is so very informative. Very much excited to be in the cruise with your worthwhile experiences, vividly told in words and photos. Keep on keeping up! Nice Article!, I have gone to Phuket on last year and stayed at Villa Sanyanga, this is a luxury villa for rent in Surin Beach Phuket. There are six bedroom, which can sleep up to 14 guests. I thinks this is a wonderful villa for me and it will be the best choice for you, your family and friends. Thank you for nice post. Phuket island has so many fantastic beaches which will make a lot of attention from the tourists who visit the island. Well designed submit, properly looked into in addition to ideal for personally afterwards. Hi, had booked the cruise in Mar 2013 for my family 2A + 2C. I am looking at their shore excursion and called up the centre to check but I can’t get my reply. Hope you can help. When the ferry send us to shore, is it Patong Beach or others? According to one of the shore excursion to Patong beach need around 1 hour travel. I am thinking to bring my kids to the beach for water sport, is there enough play on that beach which the cruise stop? Thank alot. the beach where our cruise dropped us off is Patong beach (but that was 4 years ago) so it might have changed. Thanks for your reply. I will do somemore research and looking forward to this trip. 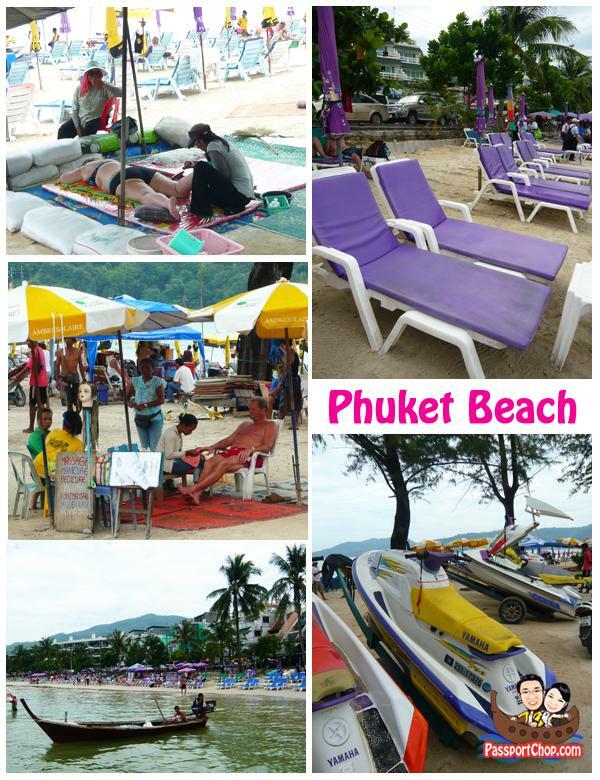 How do one secure a tender ticket for a boat to the Phuket beach ? Is it free by Royal Caribbean? Thank you very much for your reply. My family and I will be taking the 4N cruise from 3rd Jan 2013. Your blog will be a very good source of information for us. Hi Jason, can you share some info on your cruise trip which stop at Phuket beach. My list show Patong beach, is it at the main tourist area with all shop and sea sport which don’t need travel to other location? Thank alot. Hi Belle – if your cruise tethers off Patong Beach then you are in luck because that’s the main tourist area. But that also means lots of expensive tourist traps – so shop around for the best bargain. We arrive at Phuket on 7 April, 2013 on board the legend of the seas and are keen to visit Phuket Orchid Farm. There is not too much information, especially on the best way to get there and back. Any assistance in this regard will be greatly appreciated. Many thanks. U will have to check with the Cruise if they offer some cruise excursions. If not, you can consider arranging with a local Phuket tour guide to meet you when your cruise arrives at Phuket. Many thanks, greatly appreciated, kind regards. Last month my husband and I visited Phuket island of Thailand. One of the places we really enjoyed was a Thai Cultural Theme Park – Phuket FantaSea. Every service area there was beautiful and neat. We enjoyed watching their beautiful, costumed parade culminating at an outdoor stage with a Bangok theme show. The place is really somewhat like Disneyland of Thailand! The highlight their main show held at a beautiful Palace of the Elephants Theater. I must say it was pretty amazing, I left overwhelmed by their beautiful culture. International buffet dinner was good, particularly the noodle soup. We remember it as one of our nicest outings in Phuket and do recommend it for a quality evening-into-the-night entertainment. Don’t miss it! excursion offered by local tour operators are definitely cheaper than what the cruise ship charges. I dont have any recommendations – check tripadvisor forums for tour operators with good reviews. If you wish to Book shore excursions From Early April till End October every year the Cruise Ships Dock at Ao Makham Deep Sea Port. From End October til Early April to Cruise Ships Stop at Patong Beach bay and use Tender Boats to the temporary pier. Do I required a visa to visit Phuket from this cruise trip. I am planning Singapore-Penang-Phuket 4 nights.